In the wake of the brutal Turkish coup attempt, it is clear that contrary to their intentions, the putschists have given Erdoğan’s regime a kiss of life. Perhaps the defeat of the coup will not bring about more democracy, but it definitely saved Turkey from a worse military autocracy. The choice set for the Turkish people as the coup kicked off was between rewinding their country’s democratic progress by 30 years or 50 years. With such narrow options, in the interest of survival Turks simply had to pick the lesser of two evils, and so they did. Amid the post-coup chaos, most could not care less whether wholesale purges during the ensuing and ongoing state of emergency have increasingly been extended to the rest of the political opposition. And it is with remarkable skill that Erdoğan managed the crisis – a textbook case for civilian leaders who have the full loyalty of their electorate. One may still question why he recklessly endangered civilian lives, instead of sending the outnumbering segment of the security apparatus to face this minority junta. However, this stunt made it look more like he would also risk his own life alongside his constituency, turning this into a war of liberation. And it worked: the coup attempt turned into an epic second war of independence with hundreds of martyrs and enough stories of heroism to last the next 50 years. A month on, the earlier hoax debates seem to finally be over. Indeed, what we learnt from those wasteful mental efforts was how observers, whether secular or conservative, local or international, were alike in their fondness for conspiracy theories. Discussion now is centred on the more notable issue of the disgraceful incompetence of the coup plotters. They were so clumsy that one would either believe it was staged, or that a messianic cult simply believed God’s miracle would finish the job for them once they kicked it off. Herein is the most rudimentary lesson to putschists: never start a coup, even if it is inadvertently leaked, during the week’s most crowded evening where the streets are so busy that it will take the military’s whole manpower just to evacuate people and send them back home. In their incompetency and rejection by the public, the plotters helped Erdoğan emerge as the acting commander-in-chief of the nation. 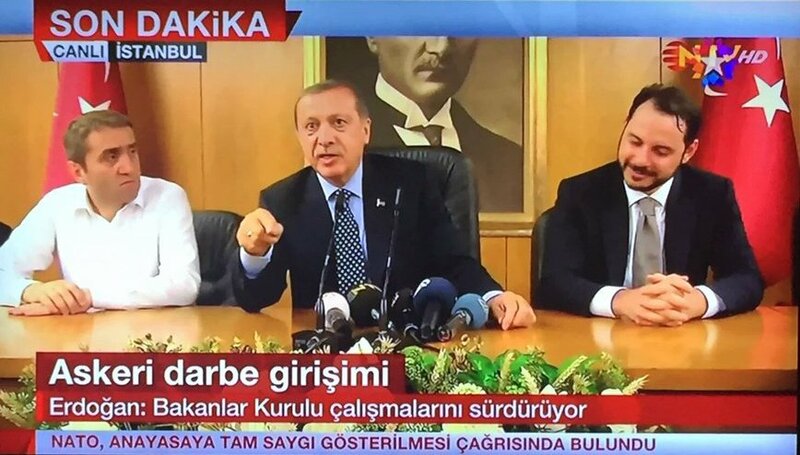 With his super-minister son-in-law smiling by his side, he was already looking ahead as he comfortably declared, “This insurgency is a blessing from Allah, because it will allow us to purge the military.” That night, he was by far the most prepared and confident compared to all other AKP officials, a stark contrast to his panic at Gezi. The controversy is now focused on how long ago and by whom he was informed. However, the decisive factor that beat the coup was not just that it was amateurish, nor that everyone – people, parties, and the media both conservative and secular – stood by civilian rule. It was also because the Gülenist officers, followers of the reclusive yet hugely influential Turkish cleric Fethullah Gülen, were officially declared and believed to be the mastermind from the onset. The majority of the secular Kemalist officers would never accept their eternal arch enemy’s taking over the military along with the country. Erdoğan may be disliked, but Gülen is abhorred. For many sceptics who are accustomed to the pro-government media’s years long smear campaign against Gülenists, the government’s immediate pointing fingers at Gülen did not seem so credible. But now we know, and can confirm with many families and friends of Gülenists, that among some of the most brutal plotters were Gülenist officers who massacred civilians, despite the public image of peace they have painted for themselves through their global network. Instead of waging a democratic struggle, how could the Gülenists be so irrational by committing a kamikaze act for the movement? We still have not substantiated the claims that Gülenists were the mastermind and Gülen himself knew or ordered the coup, although there seems to be no other faction to be thus accused so far. Nonetheless, Gülen’s immediate blanket denial will not cut this time; he owes the Turkish people and the world, who bought into his civil, peaceful Islamic image, a clear explanation about his loyalists’ involvement. Now that the crackdown is also resulting in the persecution of thousands of his innocent followers, perhaps it is time Gülen gives a satisfactory explanation about their role. Crucially, he must answer about how his deputy, Dr. Adil Öksüz, an Islamic studies professor at Sakarya University, came to be captured at the Akıncı airbase during the coup attempt. This will help his endangered followers more than his incessant insults at the coup resisters or his endless preaching of patience and forbearance with references to the ordeals faced by the Prophet Muhammad’s Companions. Regardless of Gülen’s exact role in it, the contentious break-up of the post-2002 Turkish state’s American-blessed AKP-Gülenist marriage has now turned ugly and bloody – a Turkish style divorce. In this conflict, as Erdogan consolidates his power everybody is a Gülenist suspect, including Marxists and atheists, and you can go back to your job only if you can absolve yourself. The game to contest Erdoğan’s power seems to be over for now. A power transition through democratic means is much less imaginable for a victorious president who vies for an executive presidential system. Rather than contesting Erdoğan’s bid for ever more power, the democratic struggle in Turkey will have to be much more on the defensive by preserving whatever is left of the rule of law and preventing the government abuses on issues such as collective punishment, guilt by association, due process, habeas corpus, prisoners’ rights, and torture. A behemoth’s crackdown on Gülenists means an even more repressive government. Out of this mess, one thing is for sure: Turkish moderate Islamism, on which reams of academic literature has been produced over the last couple of decades, will now go down the drain with the AKP and the Gülenists, both of whom will be remembered by the 2016 massacres. For academics for peace, the coup attempt has simply confirmed our petition’s point regarding a military’s atrocities against innocent civilians. That the commander who was praised by government mouthpieces only a few months ago for “cleansing” in Kurdish towns of Sur and Cizre is now arrested as a coup plotter speaks volumes. For now, we can all bid adieu to Turkish moderate Islamism. * This article is second of a three-part series on the July 2016 failed military coup in Turkey. See part one here. Dr Halil Ibrahim Yenigün is a Fellow of Europe in the Middle East—the Middle East in Europe (EUME) at the Forum Transregionale Studien, Berlin. He was previously Assistant Professor of Political Theory at Istanbul Commerce University. His primary research is on contemporary Muslim political thought and Islamism, and he has lectured and written on Islamism, peace activism, and Turkish democracy. Yenigün is also an Academic for Peace and he is involved with several NGOs in Turkey that work on human rights, social justice and free circulation of ideas. He can be followed @yenigun_EN. « Is Wolf-Whistling Really a Hate Crime?